If you had asked me where I saw myself in 10 years, my 2002-high school self would have never have imagined herself to be in the best shape of her life; nor would she have in her wildest dreams suggested participating in in both fitness/figure competitions or run a half marathon. I was a typical high school girl. I hated gym class and did everything I could to get out of running track, playing sports. I sucked and it was mortifying. My experiences with school based gym class almost nearly turned me off of wanting a career in health. That was until I met a teacher who understood that some people just need another space. Enter Mr. T who introduced me to the world of weight lifting. So how did I get from there to here? Baby steps. I learned that food was not my enemy and I did not have to treat food as if it was the last time I was ever going to eat it. I stopped looking at the scale and I started exercising for the pleasure of it. I found that competitive sports and group activities were just not my thing and I realised I loved weight lifting and competing with myself. And I continued to challenge myself. Even when it was uncomfortable. I had to do the half marathon (21.1 km) it was a new challenge and put me out of my comfort zone. Best of all I only had to compete with myself. The last time I had run was in high school. Seriously. I felt the need to do this to move past those failed track and field meets and stupid 100 metre races....I needed to put high school behind me. So 8 weeks out I started training. and then the worst thing happened. INJURY. With my longest run only 12 km long, I was 3 weeks from race day. At that point, I couldn’t train AT ALL and had to wait for the injury to heal. Race day came. It was cold and wet and I was scared. EXTREMELY worried about re-injury, and of course not finishing. 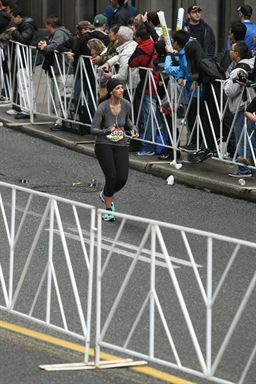 But once I was out there the camaraderie of fellow runners, the crowd cheering was infectious and powerful beyond words. By the time I hit the 12 km I was done. I wanted to stop. EVERYTHING hurt. But what kept me going was running for a cause very dear to my heart - ALS. Somehow I managed to pass the 14 km mark, and then the 17 km mark I just kept thinking of all those people who could not run who had ALS and I had to do it for them. I had to finish. The last to 2 km was the most difficult. I was tired, I was starting to get cold. At that moment I pictured my high school self, pushed aside those negative thoughts from a past life and kept moving my feet. Getting that medal and crossing the finish line was the most overwhelming moment of my life. I couldn’t have been more thrilled. I finished in 2 hrs and 36 min and though I didn’t finish in the time I wanted, I outran the ghosts from my past. Even though I didn't know you in high school, I find it inspiring how far you've come!! My caring friend side has to say 'approach training carefully and know your limits' but with that out of the way: CONGRATULATIONS! You should be proud of yourself. I love that you are determined and never give up. This is such an inspiring post! I've always wanted to run a half-marathon, but am scared I won't be able to do it. You've inspired me to give it shot! Wow good for you! 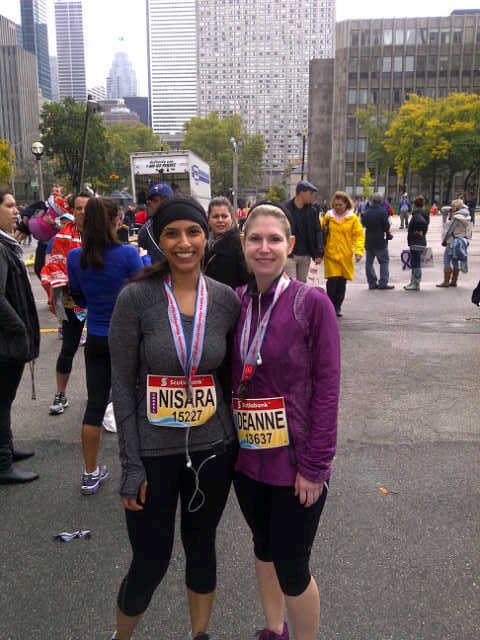 You're so inspiring, I've always wanted to do a half marathon but have always been too nervous/doubtful of myself! If you need a running buddy next spring look no further! I'm not sure how long i'll take before I run a race after the bebe but fingers crossed the fall. I love running and know how challenging it can be, I mean it when I say I'm so proud you finished the race! Kudos to you for running through the pain! I hated gym in school but love running now....that's so amazing you conquered such an achievement! Congrats! That's such a huge accomplishment! Haha Glad I could be of service : ) and you can do it!